The year 1607 was a momentous year for Prince Khurram, the eldest son of Emperor Jahangir and his father's favourite. He was a young handsome prince accustomed to luxury and refinement. As he made his way to the Meena bazaar, the private market attached to the harem, he was surrounded by a string of fawning companions, all eager to catch his eye. Even at 15, young Khurram cut a dashing figure with his father's aristocratic nose, high forehead and large languid eyes. Every maid at the bazaar carried a torch for him. Arjumand Banu sat with her silks and glass beads at her shop. She was the daughter of Asaf Khan, the brother of the emperor Jahangir's consort, Noorjahan. Exquisitely pretty, Khurram was drawn to her. He saw a piece of glass at her stall and asked its worth. When she saucily replied that it was diamond and not glass he gave her ten thousand rupees (a sum she boldly said he could not afford), picked up the piece of glass and left carryimg with him her image in his mind. The next day Khurram boldly presented his case before the Emperor seeking Arjumand's hand in marriage. The Emperor raised his hand in assent, perhaps recalling his own love for Noorjahan. However, five years were to pass before Khurram was to marry his beloved. Meanwhile, he was married to Quandari Begum, a Persian princess, for political reasons. The astrologers chose 1612 as auspicious for Khurranb's union with Arjumand. By now he was 20, and she, 19. It was a grand wedding, as befits an Emperor's son. Jahangir and Khurram went in procession, surrounded by nobles, musicians and dancers, acrobats, rare animals in cages, slaves and priests. Jahangir himself adorned Khurram with the wedding wreath of pearls. On the bride, he bestowed great honours. Deeply influenced by her aunt, Noorjahan, Arjumand Banu was, unlike her aunt, compassionate, generous and demure. Court poets woud celebrate her beauty saying the moon hid in shame before her. 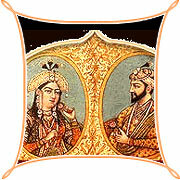 She was inseparable from Khurram and often accompanied him with an entourage when he went to fight wars. In her 19 years of marriage, she bore him 14 children, 7 of whom died in infancy. Mumtaz Mahal died in childbirth in 1630 ib the Deccan where she had gone accompanying Shah Jahan as he went to war with Khan Jahanb Lodi. As she lay on her death bed, it is said that she whispered to him to build for her a monument that would symbolize the beauty of their love. For a week Shah Jahan remained behind closed doors. When he emerged his hair had turned white, his back was bent, his face worn with despair. The entire kingdom was ordered into mourning for two years. As a tribute to a beautiful woman and as a monument to enduring love, the Taj reveals its subtleties at leisure. The rectangular base of Taj is in itself symbolic of the different sides from which to view a beautiful woman. The main gate is like a veil to a woman's face which should be lifted delicately, gently and without haste on the wedding night. Shah Jahan surely had his chaste and exquisite bride in mind when he planned the Taj Mahal.